Email: My academic email address is mjafari [at] sharif [dot] edu and my personal email address is mahdijafaris [at] gmail [dot] com. I am currently an assistant professor at the Computer Engineering Department of Sharif University of Technology and I am leading the Information, Network, and Learning (INL) lab. Prior to that, I was a postdoctoral fellow at the Institute of Network Coding in The Chinese University of Hong Kong. I received my PhD and MSc degrees both in Computer Sciences and Communication Systems from the Swiss Federal Institute of Technology (EPFL), where I was working under the supervision of Prof. Christina Fragouli, as a member of the Algorithmic Research on Network Information laboratory (ARNI). I also earned my BSc degree in Electrical Engineering and Physics both from Sharif University of Technology, Tehran, Iran. I am in general interested in various fundamental problems related to processing, manipulation, transmission, and analyzing information. 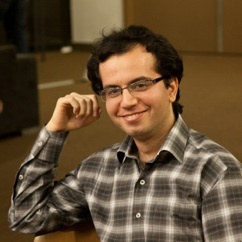 My research interests mainly focus on understanding the fundamental limits of such problems as well as design of new techniques and algorithms that are suitable for practical implementation.